In order for your business to be competitive in today's marketplace, having a responsive online identity is one of the most important keys to success. You must engage your potential customers in a manner that is most convenient for them (and not necessarily for you), which means that your website has to be responsive to all types of visitors. As our technologies continue to increase at an extraordinary rate, more and more people are accessing the internet using mobile technology, rather than using traditional desktop and laptop computers. It is critical that your online marketing strategy considers and acts on this recent phenomenon. In fact, it has very recently become imperative that you maximize your websites responsiveness to mobile technology, because Google on April 21st, 2015 started to penalize websites that are not responsive to these technologies. You may currently have a well-designed website that effectively communicates your message; and your site might be ranking well right now for your target keywords or keyword phrases, but if your website is "non-responsive" to mobile technology, you will begin to see dramatic decreases in your website's search engine rankings from mobile searches in the very near future. Have you ever used your smart phone or tablet to access a website? Did you find that you had to work really hard to see all of the website - scrolling this way and that - to see everything on the webpage? 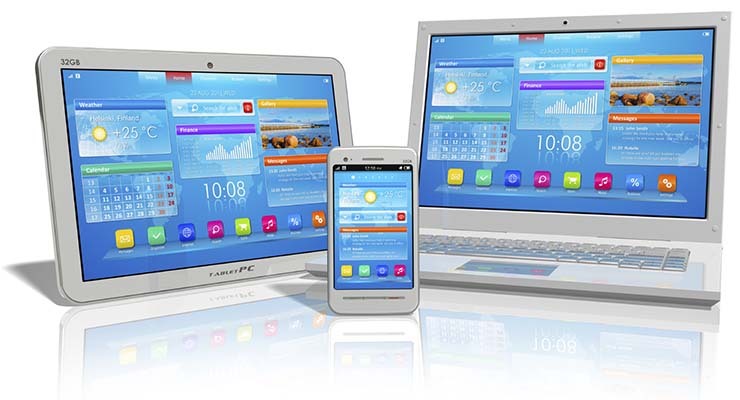 A responsive website allows you - the website owner - to provide any user an enjoyable experience when they visit your website, no matter what type of device they are using to access your website, because the website scales itself to the size of the device's window. Google is still the king when it comes to search engine clout. Which is why when Google speaks, anyone with a website listens, or at least should! Google has publicly stated that responsive websites represent industry best practices. This means that Google will rank websites that utilize responsive website design over those that don't on searches from mobile devices. Google's reasoning behind this is simple. A responsive website design uses one URL and the same HTML coding no matter what type of browser or device it is displayed on. This makes it easier for search engines to index and allows users to enjoy one comprehensive experience, no matter if they are viewing the website on a mobile device, a tablet, laptop or desktop computer. Google believes that not only will they benefit from only having to store information about one version of a website rather than multiple, their user base will be able to access, share, link and interact with the content better. Google is placing emphasis on the user experience when it comes to ranking a website as well. Responsive website design not only scores points with Google. It also scores points with your visitors, who are more likely to share their great experience on your website with others, boosting your ability to grow your website's user base organically. Last but not least, having a responsive website design means you only have to make changes/updates to your site once versus having a separate mobile or m.site or an app for mobile users. You only have to manage one website, pay for one URL, manage one SEO campaign, etc. Etc. Etc. Not only is this a huge time saver, you also get to save money as well. Does Your Website Require Conversion? We can easily determine if your website needs to be converted to a responsive website design in seconds. If you are not sure, or if you know your website is non-responsive, we can fix that for you very quickly. At BANG! Web Site Design, we have promoted responsive website design for years, knowing that it is critical to a site visitor's user experience and anticipating that it would eventually become a critical element of getting websites to rank well with the search engines. That time has arrived - do not delay making your website responsive. Responsive website design is now considered a "best-practice" in website design strategy. If you are ready to make the leap, BANG! Web Site Design is ready to help. Call us at 602-427-5626 or click today to find out how affordable it is to get a great looking, mobile optimized, responsive website.